We all know that cigarette smoking is injurious to health and that it causes several irreversible damages to our body thereby reducing the life span. According to the latest WHO statistics, the tobacco epidemic is one of the alarming threats to public health, as it is responsible for killing around 6 million people annually. More than 5 million of deaths are the result of direct tobacco use while more than 60,00,00 are the result of non-smokers being exposed to second-hand smoke. As per Global Adult Tobacco Survey India, the situation is equally alarming in India with an estimated number of tobacco consumers being 274.9 million, of which 163.7 million consumers of only smokeless tobacco (passive smokers), 68.9 million are smokers and 42.3 million users are both smoking and smokeless tobacco users. Data represents around 35% of adults in India use tobacco in different forms like Cigarette, Bidi, Cigar, Hookah (Hubble bubble), Sheesha, Tobacco chewing. Use of smokeless tobacco (passive smoking) is more prevalent in India (21%). This is a poisonous gas. Carbon monoxide hampers the functioning of the heart and brain, causing symptoms like fatigue, weakness, and dizziness. It is especially toxic for foetus, infants and individual having cardiac complications. It consists of several carcinogenic chemicals. When cigarette smoke is inhaled; about 70% of the residue is retained in the lungs of active smoker. present in tobacco is the cause for predominant behaviour effects, eventually leading to addiction. 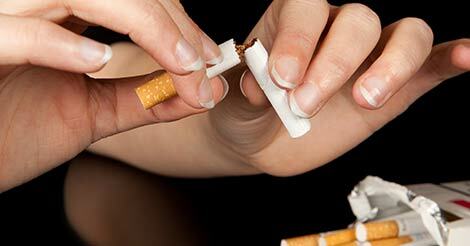 Cigarette smoking is responsible for harmful effect on our body organs. Smoking could lead to diseases like cancer, chronic respiratory diseases, and heart complications, peptic ulcer disease, impotence, and complications in pregnancy. How Does Cigarette Smoking Increase Cancer Risk? Smoking is a preventable cause of cancer. Cigarette smoke contains over 4,000 different compounds of which significant number are toxic (poisonous) and carcinogenic substances. These toxic chemicals enter our blood stream and damage the cell DNA which leads to less effective immune system. Smoking cigarettes can cause at least 14 different types of cancer; lung cancer is the number 1 risk factor of smoking. It's never too late to make healthy choices, if you wish to quit smoking and want a healthy life. Help yourself by undergoing health screening to know your complete health status and making sure next phase of life is healthy. Get to know your health status by the customised comprehensive health checkup packages provided by Indus Health Plus, the preventive health checkup specialist. To know more about us, health checkup packages details, share a thought, tips for healthy living, query and suggestion fill the query form and we will get back at you at earliest.